In the early days of blogging, display advertising was the primary means for monetizing a website. Lots of bloggers still use display ads, but it’s not the most profitable way to leverage your blog. In fact, display advertising can actually do more harm than good. More often than not, when visitors arrive at a food blog, it’s because they’re interested in a particular recipe. If your visitor’s effort to scroll down to that gold nugget is blocked or slowed down by popup and inline ads, there’s a solid chance she’s going to go back to the search engine results page and find another recipe that loads faster without all the distraction. Fortunately, there are lots of ways to make money using your blog beyond display advertising. By diversifying your income stream, you can limit your display advertising to reduce slow down and improve user experience. If any one stream dries up for a season, you’ll have other revenue to keep your resources flush. 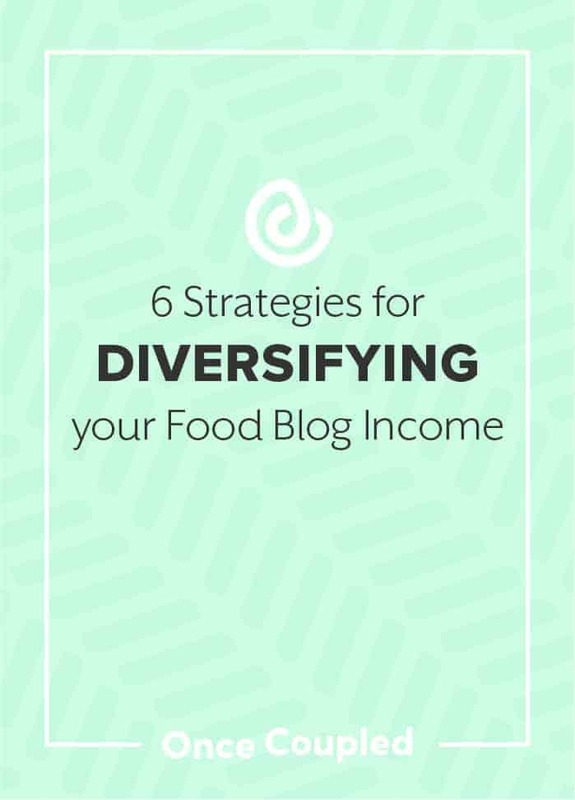 Affiliate marketing done well can be a powerful addition to your food blog revenue. Unlike display ads, affiliate marketing allows you to more subtly integrate third party sales into your food blog content. In most cases, the third party merchant provides an affiliate link for you to share on your blog, usually couched in content so as not to disrupt the flow of your blog. When a visitor clicks on the link, they’re taken to the merchant site. If they make a purchase, you earn a commission, which can be as much as 80% of the sale. Simple Green Smoothies has one of the most beautiful affiliate web pages around. 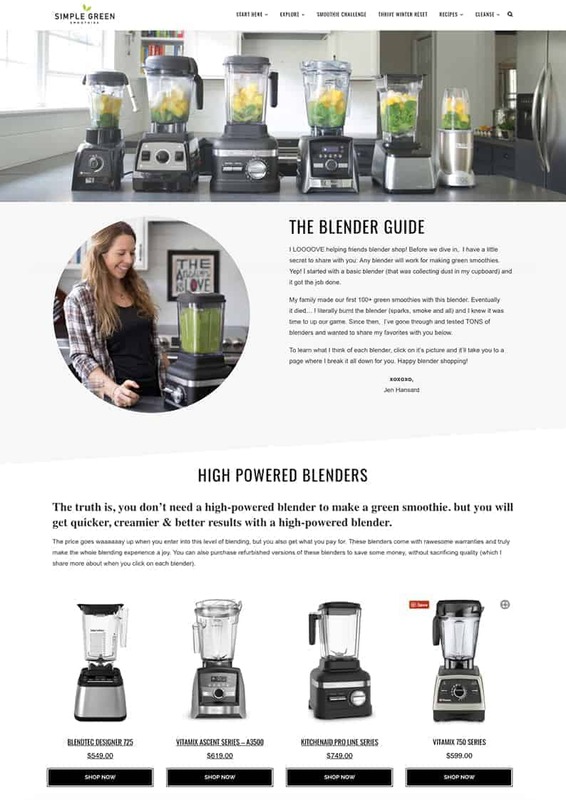 The blog’s Blender Guide provides valuable information about the best blenders on the market and creates a seamless online shopping experience despite the fact that the sales pages are on another website. The team at Simple Green Smoothies uses a combination of Amazon Affiliate links for smaller items and the more lucrative affiliate links of third party vendors like Blendtec, which is like diversifying your diversification. Like the most effective affiliate marketing, sponsored posts are a form of “native” or “inline” advertising. In other words, a sponsored post doesn’t scream SALES PITCH! the way that banner ads do. 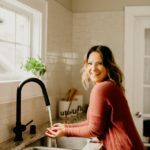 It blends in with your other blog posts because the blogger is simply doing what she does best: providing valuable information about the ingredients and products she uses regularly. That being said, food bloggers should be transparent about sponsored posts as sponsorship disclosure is required under FTC guidelines. 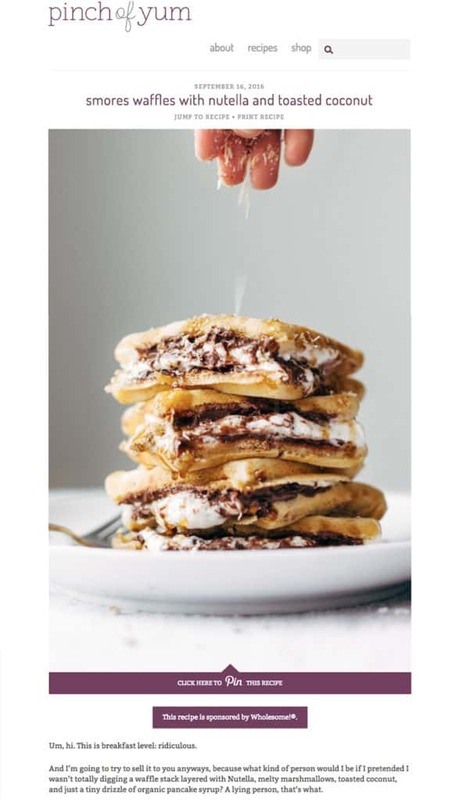 For an example of an effective sponsored post, look no further than the Smores Waffles with Nutella and Toasted Coconut from Pinch of Yum. In addition to providing a clear indication of sponsorship at the top of the post, Lindsay briefly explains why she’s so head over heels for the Wholesome! brand in the text of her post. Finding a brand that you sincerely love and use is key to a successful sponsor relationship. If you’ve invested in a professionally designed logo for your food blog, why not put that investment to good use? These days, online, print-on-demand shops like Cafe Press, Printful, and Printed Mint make it easy for bloggers and anybody else to affordably create and sell branded goodies to entice loyal followers. 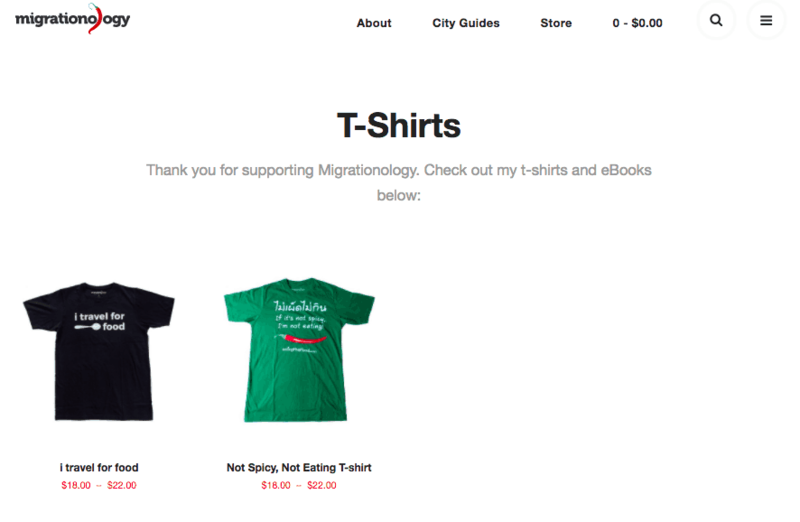 The travel-inspired food blog Migrationology offers a couple of t-shirts that allow fans to show their support and look cool while they’re doing it. While not everyone is comfortable asking visitors for donations, it’s not as uncommon as it once was. My suspicion is that Amanda Palmer’s brilliant speech on the art of asking played a role in this more forthright approach to funding personal creative projects like blogs. NYT’s journalist Maria Popova’s Brain Pickings is one of hundreds of widely respected blogs across a variety of genres that allow regular readers to make monthly contributions. It really isn’t very different than a traditional subscription model of raising revenue, and it’s worth considering if you have a committed following and you can deliver posts regularly. Hey! You’re writing anyway! 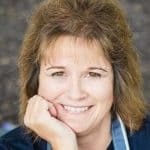 Why not turn your favorite recipes into a cookbook that you can sell on your blog, Amazon, or any other online bookshop. If you were feeling particularly enterprising, you could even create a print version to sell at local cafes and boutiques! 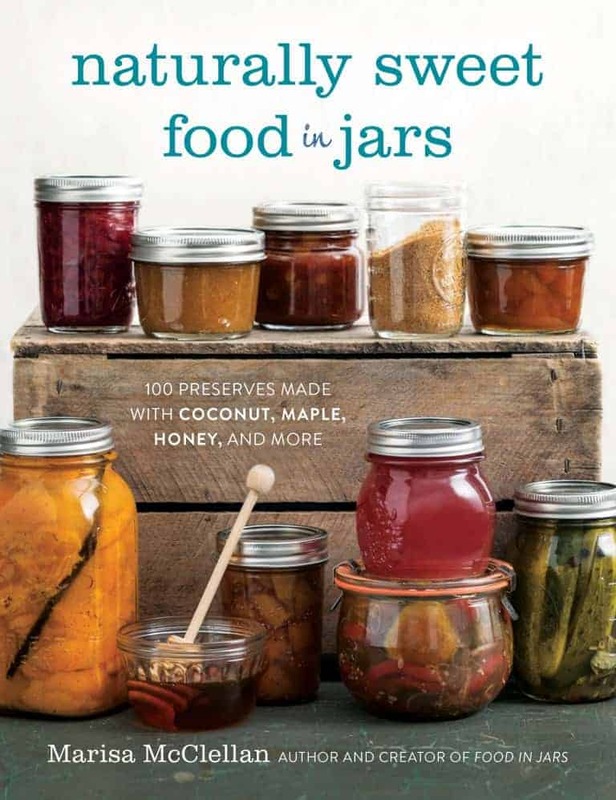 Marisa McClellan, the blogger behind Food in Jars, has developed and offered several cookbooks to her fans. 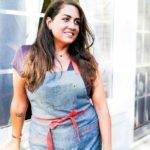 Take a look at her cookbook landing page for inspiration! If you’re not afraid of the spotlight, you could also earn extra income by participating in (or even organizing your own) events. You could lead a cooking class, host a pop-up restaurant, or entertain a crowd with your wit and charm. 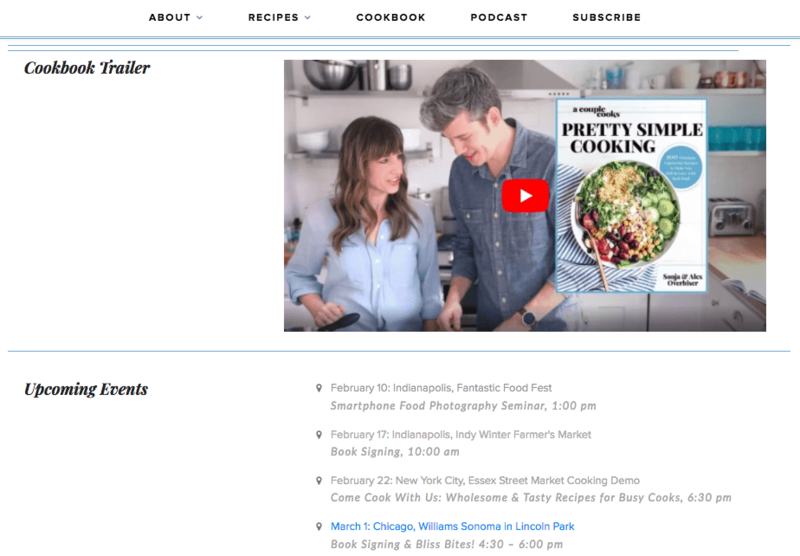 Alex and Sonja Overhiser, the bloggers at A Couple Cooks, generate lots of buzz (and some revenue) through events and their cookbook Pretty Simple Cooking. 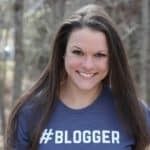 What about you and your blog? How are you diversifying your income streams?